Title: Lookup Lists TOO Long? 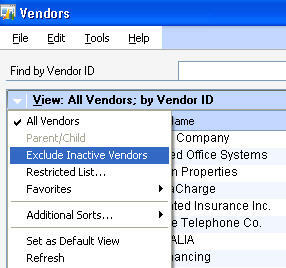 GP2010 (Version 11) gives you the ability to EXCLUDE inactive master records from your lookup window! It’s a feature you can toggle on and off, or set as a default. Once you have the master record lookup window on the screen, click on the view lookup arrow and you’ll see the option. Mark the option and that’s it! This tiny little change can make a BIG difference in speed of data entry!